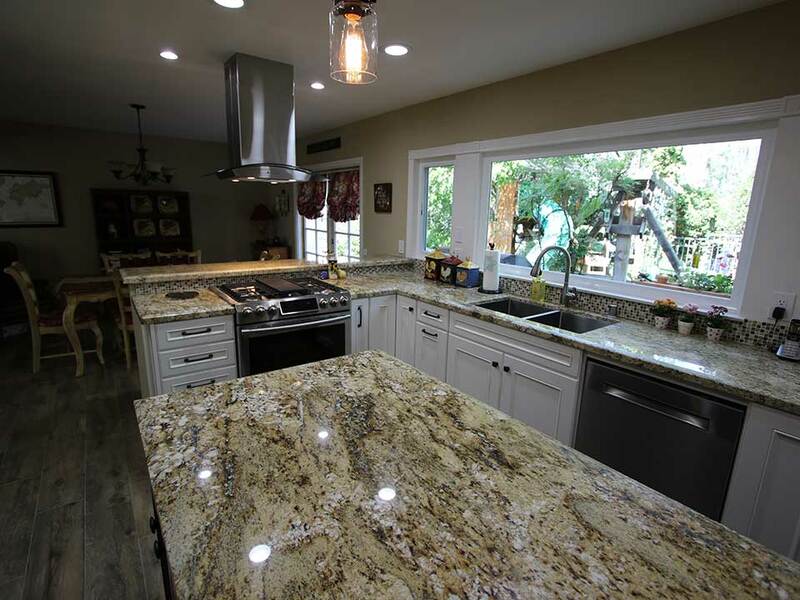 The Taylors, Orange County homeowners, were referred by their friends who were in love with their APlus remodel. 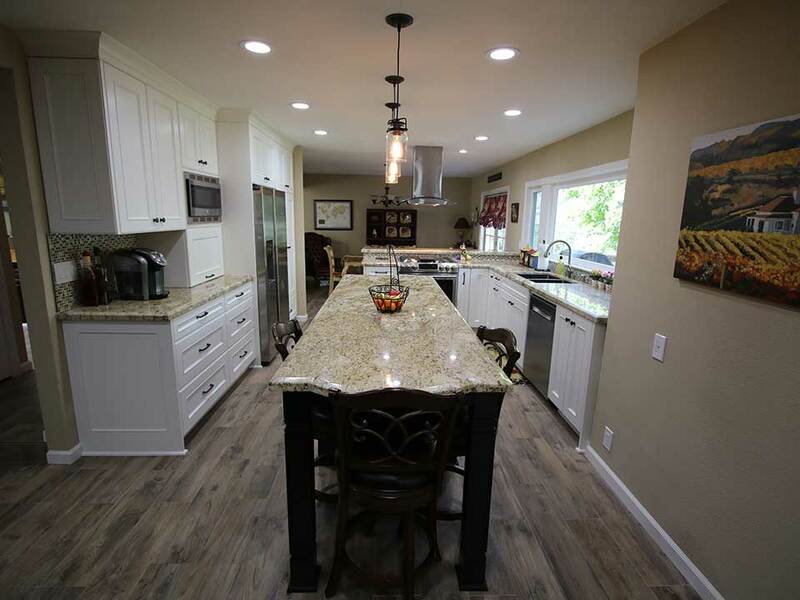 The Taylors said one of the things that stood out to them most about the remodel of their friends’ kitchen was the beautifully detailed cabinetry, and they wanted the same level of quality in their own home. 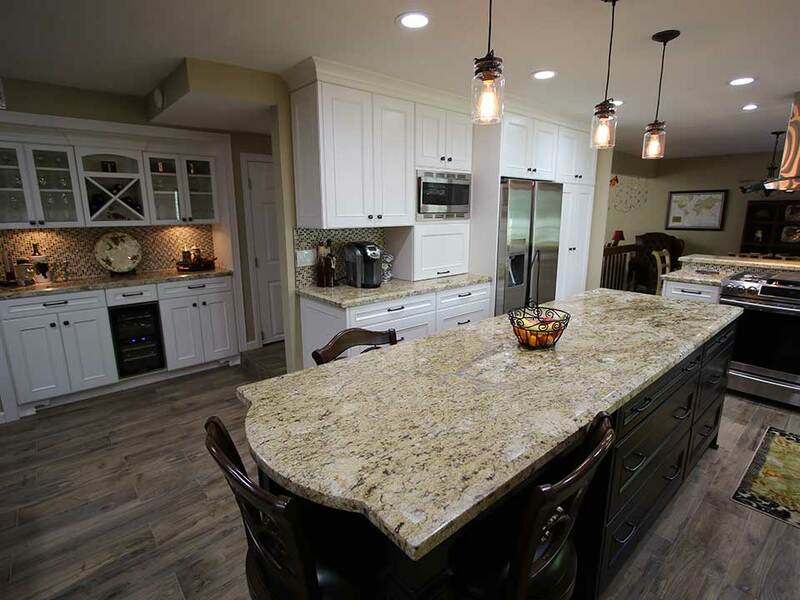 When the APlus team first met with the Taylors to talk about working on their Orange County kitchen remodel, we were greeted with a space where the dining, kitchen and family rooms were distinctly separated from one another. 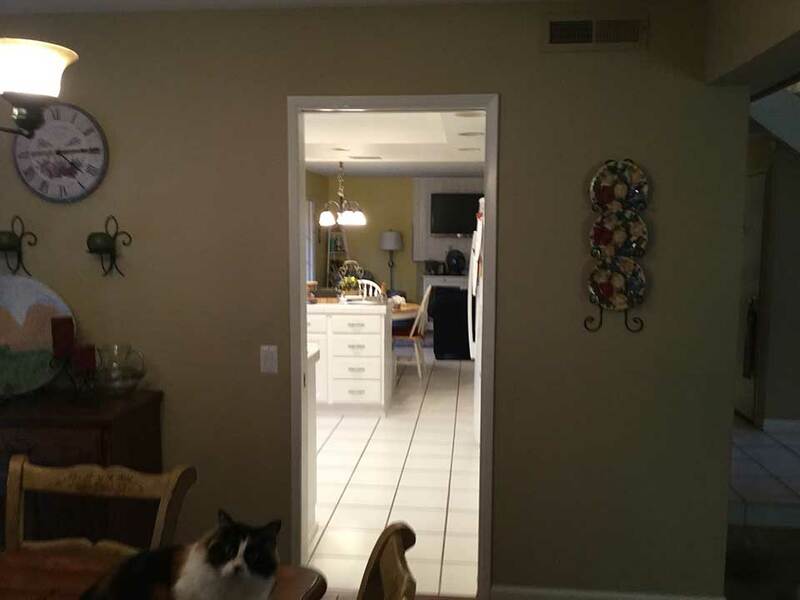 The dining room was separated from the kitchen by a large, primary wall, and the only openness between the two areas was a narrow, standard doorway. The kitchen itself featured a U-shape design, where much of the countertop space was tucked away in tight corners, there was limited cabinetry and workspace, and there was a feeling the kitchen was constrained because of the narrowness of the original layout. 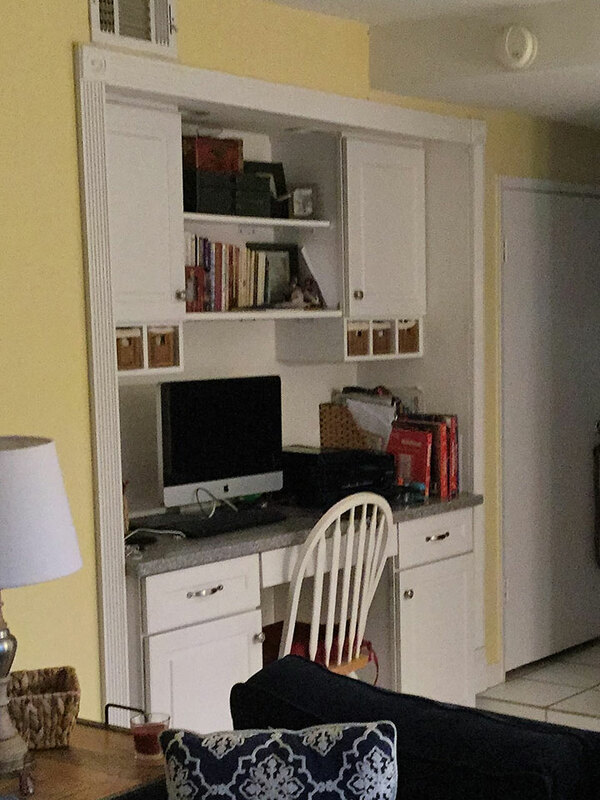 There were very few upper cabinets in the previous design, so space was almost entirely limited to the lower cabinetry in the main area of the kitchen. 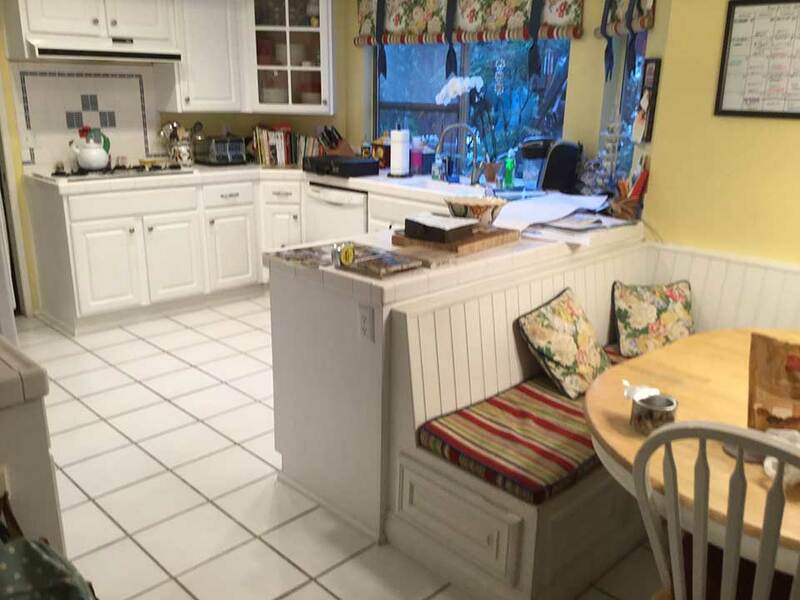 Butted up against the kitchen was a large, bulky and outdated banquette seating area, that divided the kitchen from the family room that was adjacent. The ceiling levels were uneven and low in spaces, and against the hallway wall of the kitchen, there was a small desk space that was cluttered and limited in its usage because of a lack of space. 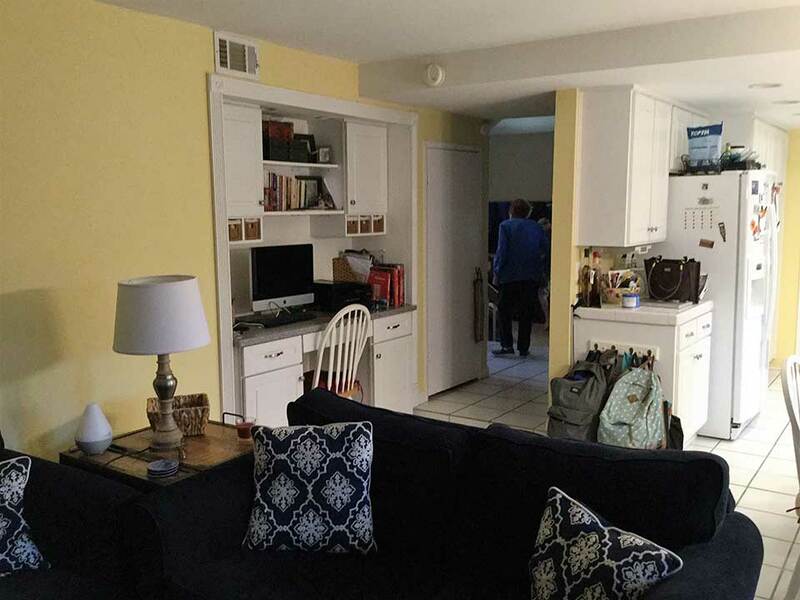 Additionally, the old refrigerator wasn’t custom-fit into the cabinetry, so it extended into the floor and took up unnecessary square footage. 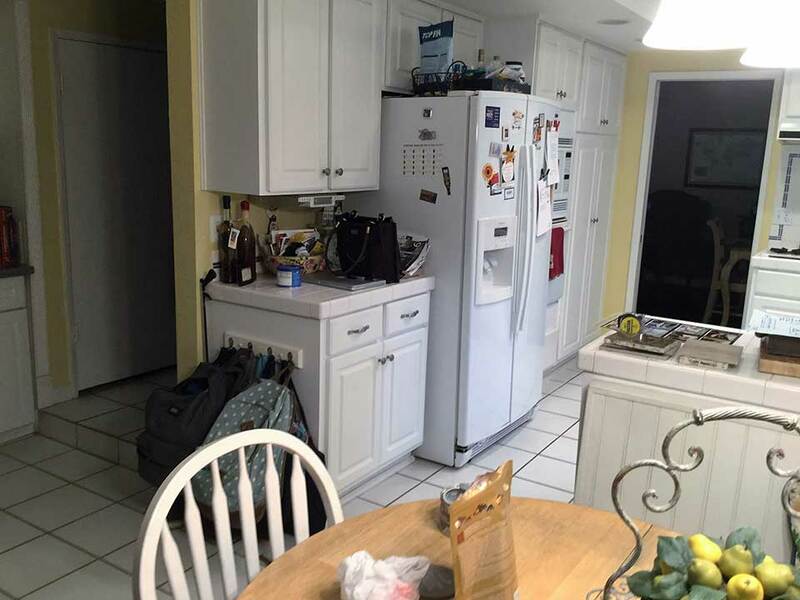 Also, the cabinets above the refrigerator then became recessed, and almost entirely unusable as a result, further limiting storage space and accessibility. 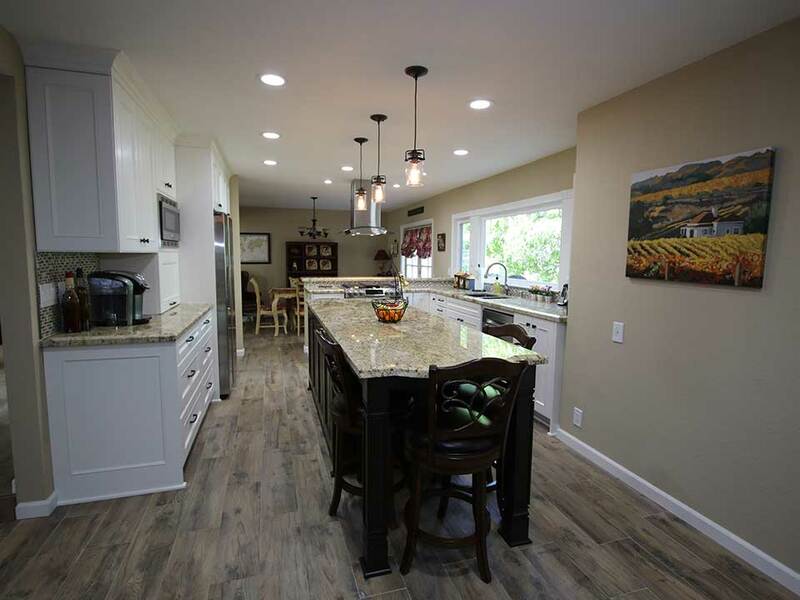 One of the key elements of this Orange County kitchen remodel was to open up the dining, kitchen and family room areas to one another and create a feeling of cohesion and a floorplan that flowed and allowed the homeowners to maximize their use of this multi-purpose space. A big part of that aspect of the project relied on taking down the wall separating the dining and kitchen areas and also removing the banquette. The ceiling was raised, and recessed lighting was added. 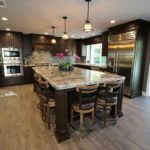 To continue the feeling of continuity so essential to this fresh, open design, we installed rustic-chic gray plank flooring that flows throughout this entire area of the home. This ensures that while each area has its own purpose and function, there is also unity which is so important in a true open-concept floorplan. Once there was a workable floorplan, which accented a linear sense of openness, we moved onto the rest of the kitchen installation in this Orange County remodel project. This included the addition of ample perimeter cabinets, with single-panel doors, solid wood construction, and a light, beautiful Swiss coffee finish. In the middle of the kitchen, an expansive island was added that combines the functionality of both a dining table/bar space, with cabinet storage. 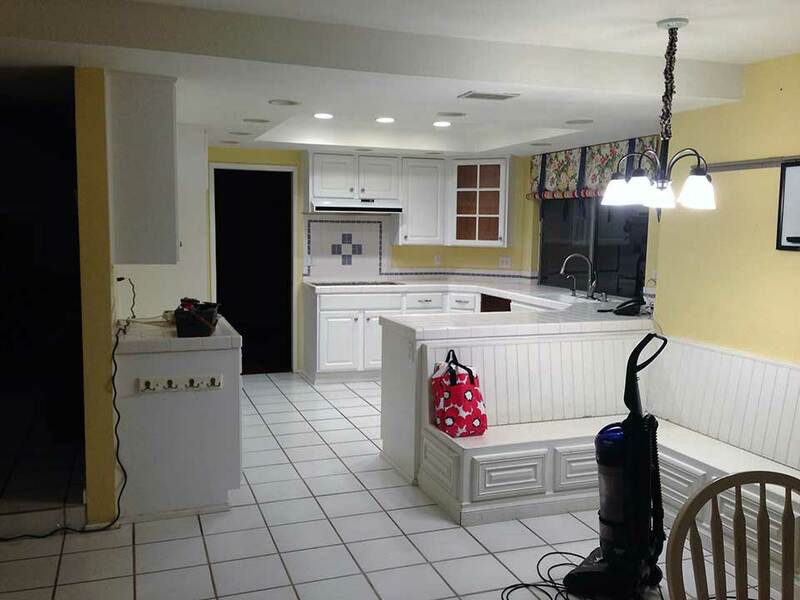 To contrast the Swiss Coffee perimeter cabinets, the island was finished in Dark Manganese. 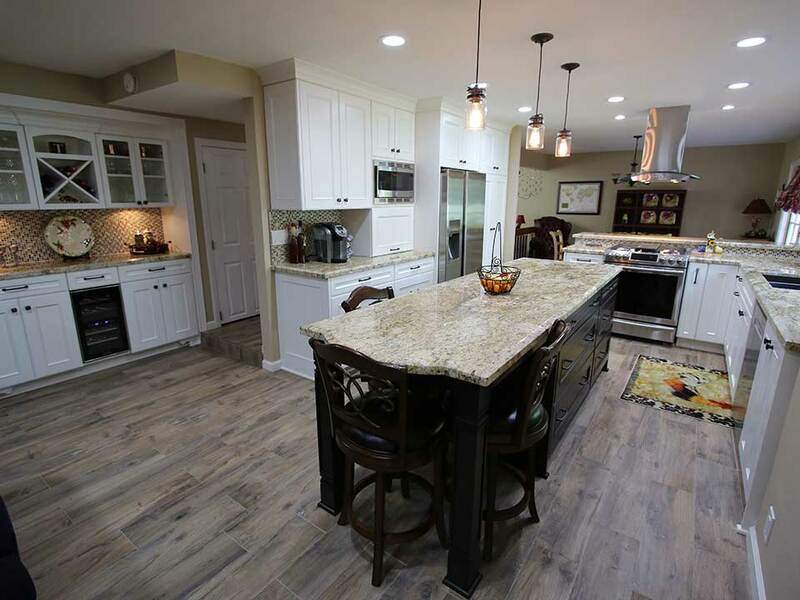 Both sets of custom cabinets feature Victorian Nadia doors, which were crafted in-house by APlus to the exact specifications of these Orange County homeowners. The island includes four cabinets, and the countertop is Yellow River granite, which is polished with a high level of variation. This granite is found throughout the entire kitchen, and it brings rich, earth tones to the light color palette of the perimeter cabinets. 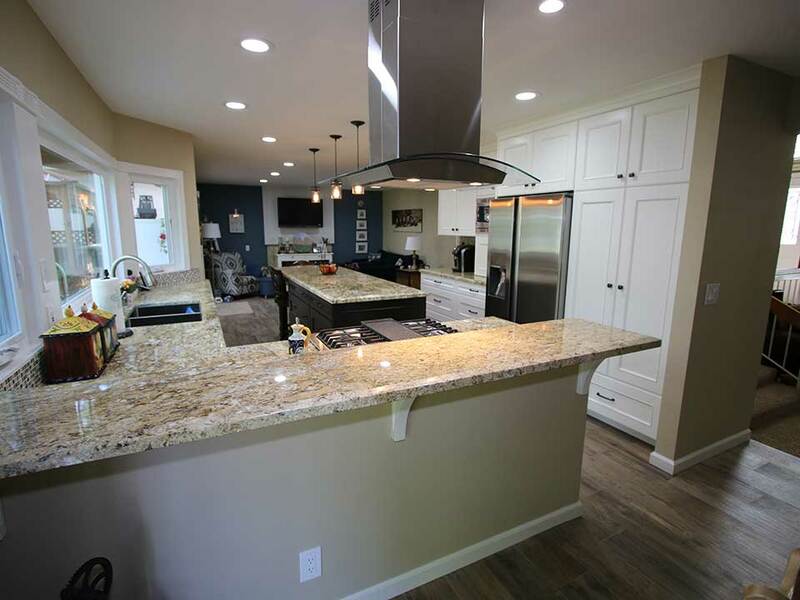 Another addition to this remodel was the inclusion of a separate bar and storage space, where the desk had once been. 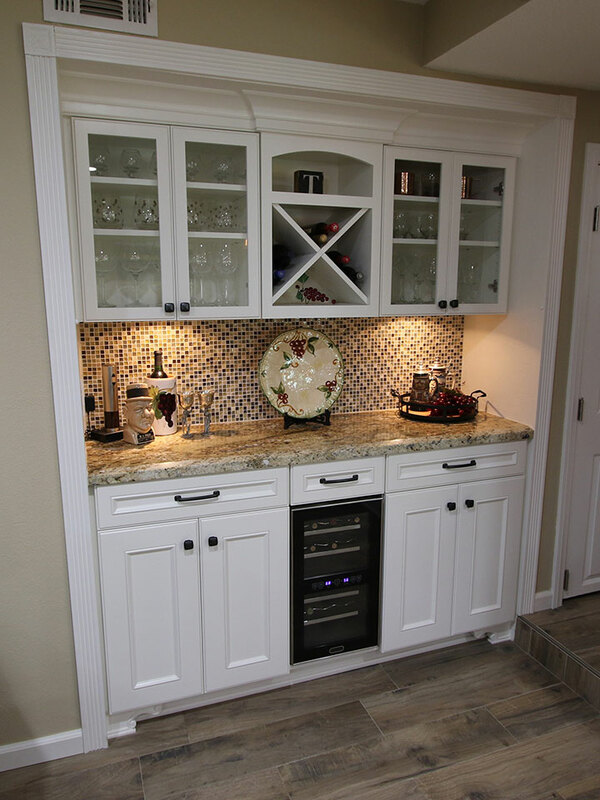 We continued the Swiss Coffee cabinetry with Victorian Nadia doors, and on the upper cabinets of this usable area, we added inset glass panels to create display areas. The granite is again Yellow River, and a built-in wine refrigerator was added. The appliances include a stainless steel canopy range hood, as well as a Samsung stainless steel refrigerator. 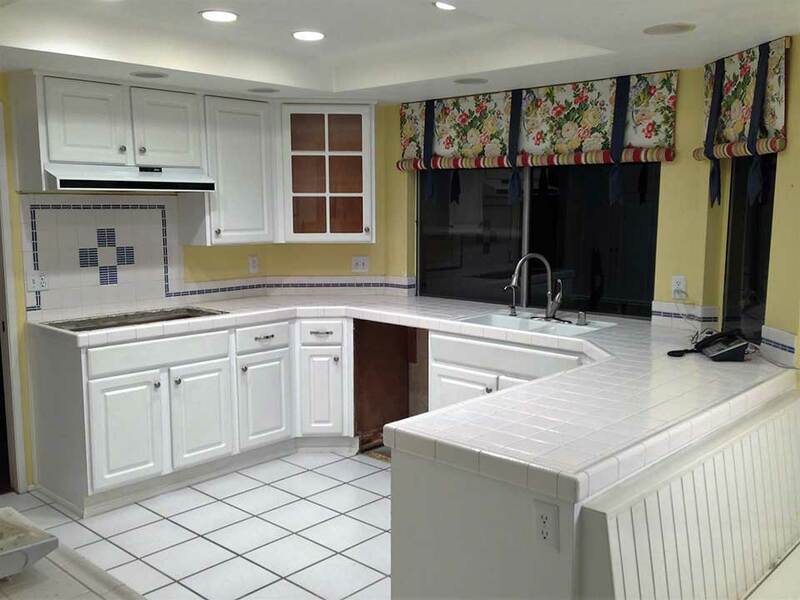 All-in-all this Orange County kitchen remodeling project ensures this kitchen is now timeless, with abundant storage space, functionality and it’s become an area of the home where the entire family can comfortably gather and entertain, without a limited floorplan.